Disc Golf might appear a bit intimidating for you in the beginning, but that doesn’t mean it won’t be fun. It doesn’t matter if your friends have invited you for a round or you have taken the initiative on your own, the game is worth it. If you have a little knowledge about traditional golf, disc golf won’t be rocket science. The main difference between the two games is that it requires flying discs instead of clubs and balls. The objective of the game is to complete each hole in the minimum number of strokes or throws. 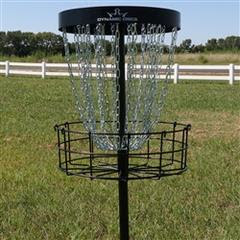 Players are required to throw the disc from the tee area towards the disc golf basket or target. The players make consecutive throws to make the disc land into the hole. Disc Golf is an interesting game that anyone can play. All you need is a basket and some discs and you are good to go. The disc golf baskets are mainly portable and permanent. Let’s take a glance at the best tips that will help you while playing the disc golf game. Being patient on the course is the first thing that you can do while playing disc golf. Even if you are not the best player, it is still okay. The game is all about the fun that you will have while playing the game. Relax, enjoy, and laugh even if you missed your goal. Give your best shot and remember, the best players were once beginners. You might have seen acclaimed players carrying a lot of discs in their golf bags. Being a beginner, you won’t need all of them. If you are unable to throw even one disc well, carrying a big lot is of no use. In the beginning, you only need a mid-range, a driver, and a putter. At this moment of time, practice is more important than anything. You need to learn the basic trick to throw the disc and learn different flight characteristics. Since you have decided to practice throwing discs, you must know that there are generally two main types of throws: forehand and backhand. The flight-paths of both these throws are different. You might be good at one but you must learn both of them so that you are able to navigate around trees and other obstacles. The game and course are a new experience for the beginners. Playing with people who have an experience in this game will help you in improving your game. They will help you in developing your own skills, strategy, and will also inspire you to practice and get better. Be open to what the experienced players want you to learn; you will definitely learn a lot of things. The best part about playing disc golf is that players can start having fun from the beginning. No matter if you become a good player or not, it can always have fun. Even a low score should be able to make you laugh. It’s a new experience, enjoy it! In the beginning, it is all about celebrating your good shots and learning from your bad shots. All in all, you must enjoy learning all of the skills that will inspire you to improve your game. The game is all about having a good time. Moreover, it is a low-cost sport that anyone can play. It doesn’t even take a lot of time to learn.